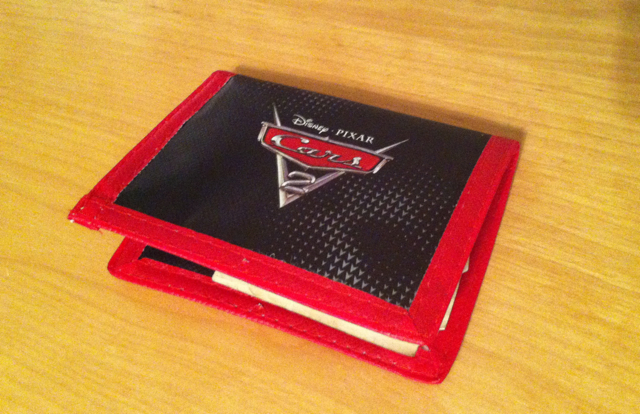 I think it may just be the last piece of Cars 2 merchandise he does not own. Max has been talking about getting one of these for his birthday for the last few months. Unlike the origins of his purple fixation and spaghetti phase, I can trace the start of this obsession—it began when he found a YouTube clip about the toy. 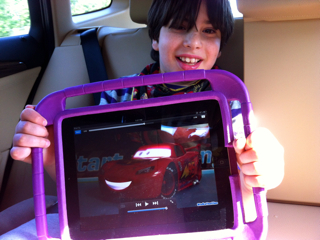 Now, he carries his iPad around with the video paused on a photo of the car. He regularly walks up to me, flashes the photo and says "Ahrs ooo!" ("Cars 2!") at which point I duly respond, "You want a Cars 2 talking Lighting McQueen for your birthday?" and then he says "Yeah!" On occasion, he wants to talk about all the elements of his upcoming birthday party (drawing near! In December! )—the Cars 2 cups, Cars 2 plates, Cars 2 tablecloth, Cars 2 napkins, Cars 2 party hats and Cars 2 ice-cream birthday cake he will have. We have already purchased them, of course, given that his party is half a year away. 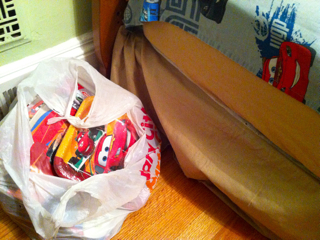 He sleeps with the bag by his (Cars 2) bedside. Um, not the ice-cream cake. You'd think I might be weary of saying "Max wants a Cars 2 talking Lightning McQueen for his birthday!" and you would be right. Except every single time, Max responds "Yeah!" like he is hearing it for the first time, and his entire face lights up. So I'm not that weary of it. There was a brief phase in which he wanted us to wear the party hats around the house, but it mercifully passed. The psychological effects remain to be seen. I mean, on me. The other day Sabrina woke me up by standing at my bedside and asking, "Mommy! Are we going to the pool today?" "Cars 2 Talking Lightning McQueen," I murmured. Dave and I sometimes tease him. "Max," one of us will say, "do you want a talking Mater for your birthday? How about a talking Francesco Bernoulli?" 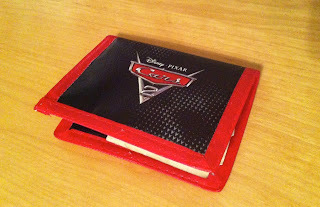 Or, worse, "Max, you don't want a Cars 2 talking Lightning McQueen for your birthday, do you?" Max doesn't much appreciate it, but we need the comic relief. We have milked this obsession for all its therapeutic worth. The speech therapists and I try hard to get Max to articulate the "c" in "car" and "t" in "two." 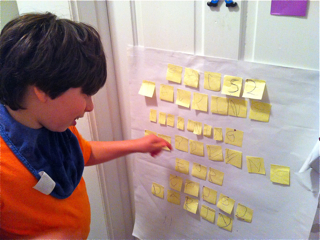 He writes out the letters of the phrase with his occupational therapist, and has a poster-size version on his bedroom door. You know, because we need the reminder. It reads, "Cars 2 talking Lightning McQueen for Cars 2 party." Surprise! In case you are wondering why we have not yet gotten one for him, it is because we are worried that when we do our family will no longer have anything to talk about. OK, actually, it's because we know that Max is seriously enjoying the anticipation. In a moment of panic, Dave recently ordered one online since life as we know it would end if they ran out of them in December. The box is sitting in our basement, hidden in a box. And if you tell Max, you are in big trouble. Meanwhile, Max has been telling us that he is saving up his money to help us buy a talking Lightning McQueen. The other day, he changed that to telling us that he is paying for the batteries. Smart kid. 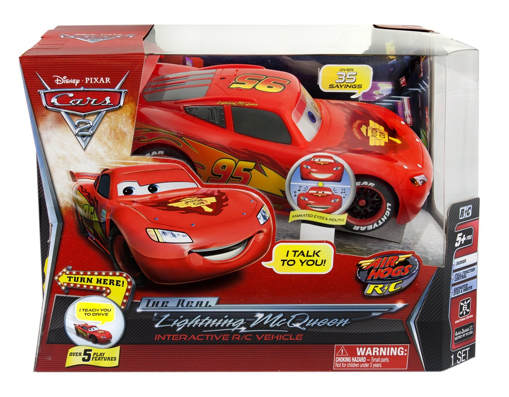 Labels: Cars 2 Air Hogs Real Lightning McQueen, Cars 2 talking Lightning McQueen, help.me. If you replace lightning McQueen with Batman, then it's the same way with my son. He's even got his own sign for Batman (and he tried so desperately to say it) It's hard not to give in to his obsession because like you said, we use it to our advantage in therapy. I loved reading this. I love this post so much. What a happy way to think about what sometimes makes those of us in this repetitive household so frustrated. You really made my day. Sarah's obsession with Curious George began around 2.5 years old. We are going on 2.5 years of watching "George 'pad" (George on the iPad) and it was old a long time ago. But we keep. watching. it. Marcus' birthday is in June, Perfectly timed so that half the year we talk about Christmas and Dec 26th there's talk of birthday. @Alison - the talking ipad aps have actually been quite a mind-saver for me, Marcus can talk and talk and talk and talk - the computer repeats him and all is well. Otherwise it used to be me. When does Cars 3 come out? Heh heh heh. Love your post! My son with CP loves riding the bus to school, and touches the "bus" icon on his iPad app over...and over..and over, especially during the summer and holiday breaks, when he doesn't get to ride it! :) When it starts to drive me a little crazy, I try to think about how blessed we are that he has wonderful bus drivers, and he loves to go to school. Max it is such a cool movie isn't it! Coops current love is either Lone Ranger Lego, minecraft or Al Capone. All of which I know nothing about and need to be taught everyday apparently! I love the part where he is sleeping with the car products next to him! I understand obsessions...ours is Mine Craft. I imagine that anything 24/7 would need comic relief! When I comment on my phone I have to put Anonymous but no need to hide identity! He's a kid he's bound to have obsessions he could be obsessed with worse things. I've seen worse. The boys in my math class do it during notes--and as loudly as possible for the sake of irritating others.